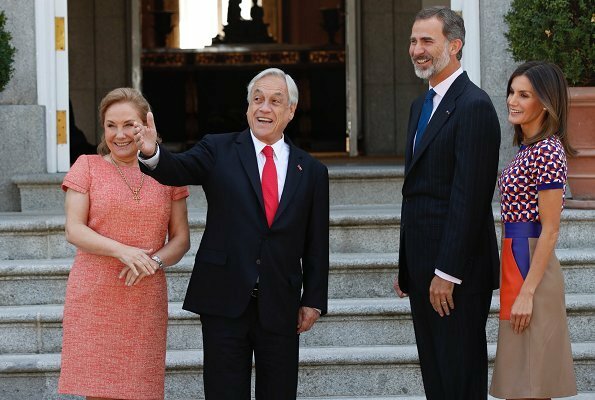 President of Chile Sebastian Pinera and his wife Cecilia Morel Montes are making a two day work visit to Spain. 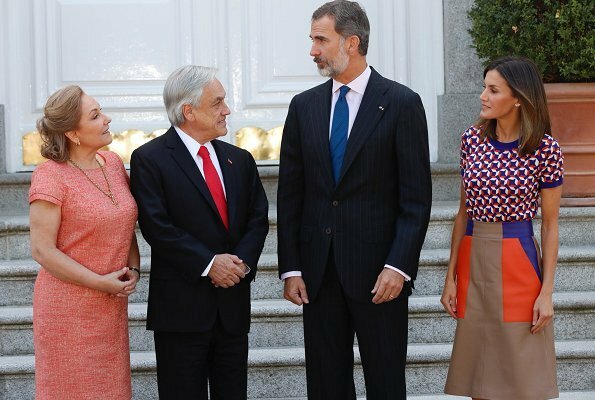 On October 9, 2018, King Felipe of Spain and Queen Letizia of Spain held a lunch at Madrid Zarzuela Palace in honour of President Sebastian Pinera and Cecilia Morel Montes. (In the morning, the Queen took part in a conference on the subject of "inclusive education, positive mental health" at the Parliament). Q Letizia must like this outfit. The top makes me dizzy. She has a lot of nice things to wear, the skirt with a uni color top may not look so bad. Well it is her who wears it not me. I love this outfit very much, it´s young in heard and spirit. Wow, this outfit got a double posting due to two separate occasions, rather unfortunate... her previous outfit of green blouse and black print skirt would have been so much better to see twice. I think this patchy skirt and those big orange patches are what makes it so strange. Still a handsome couple and love to see when the king puts his hand on her back, nice! It was the same day, hours after. No, she just arrived from the other engagement , it was some hours after. Yes, I am aware it was the same day and two separate occasions. 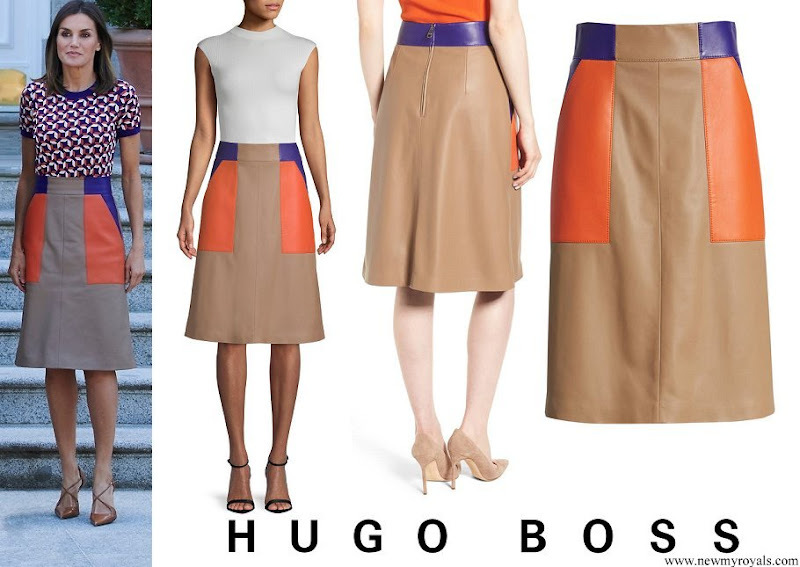 If you look beyond the 'strangeness' of a skirt and top, one of the first things to consider is that it is very difficult to dye to different fabrics to get an exact match in color. Some materials absorb more color and some less. Then all of the pieces have to be assembled into the garment. It may be strange to some, but it has its merits. ..and we know that his lady does not follow the same boring pattern. 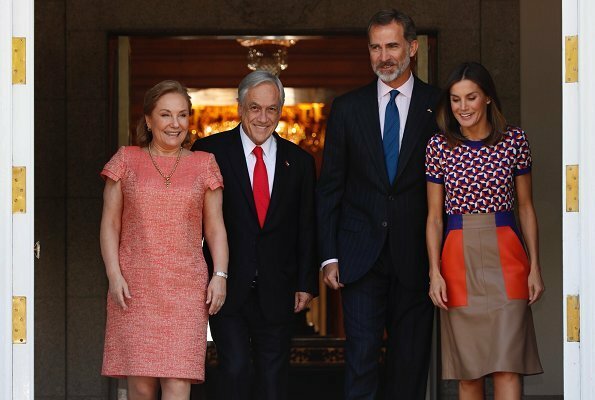 Mrs Chile is dressed simply in a pretty color, but in a fabric that we have seen the queen wear in many different colors in her 'Varela period'. One media outlet has complimented her on finding her style because she has worn the same hair and clothing silhouettes for many years. The top isn't bad. What annoys me is the design: it should be either totally horizontal or on more of an angle. Either or! The way it is, it looks like some bad leftover fabric or a bad sewing job. And her too-straight abnormal posture makes a lot of her outfits look a bit 'off'. 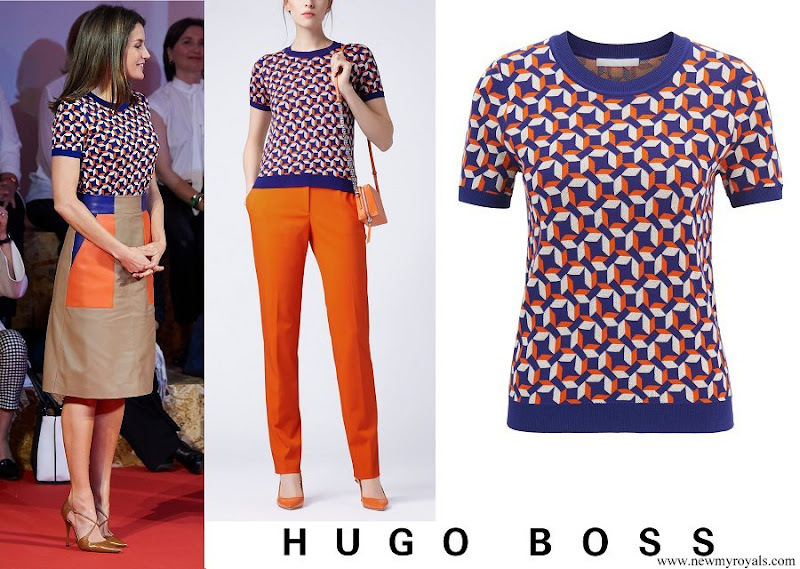 My less favorite outfit of Queen Letizia. Such a bad combo together. Don't know what she's thinking using it again and again.. The top is nice and the skirt is also nice but not together. Wat is dit een stomme outfit, de rok is net een keukenschort. 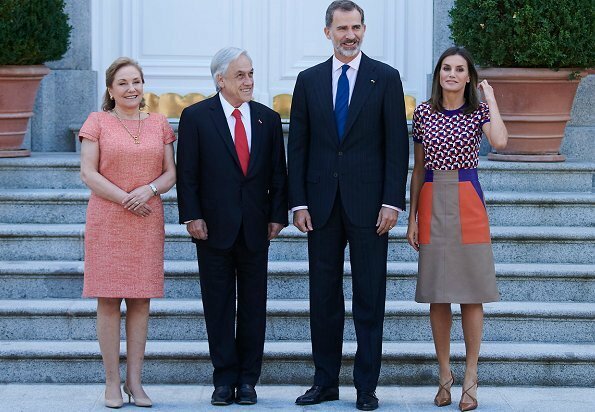 Me encanta el conjunto, es original, la sienta de maravilla, los zapatos corresponden bien a la ropa, Felipe siempre elegante.